By James Yeang in Web Design. Updated on January 8, 2019 . A well-designed newsletter/email template can be the difference between success an failure. Whether its to update customers about a product, or to share information, having a well-designed template can be a great starting point to guide your readers and give them a clear coherent flow when they read your email. This is crucial, considering how important the first impression is. Here is round-up of some of the best free HTML newsletter templates on the Internet you can download without paying a penny. Aweber has some of the best newsletter templates out there, and some of them go beyond a good design and are pretty darn functional as well. Here are 5 of the best from Aweber. This is a great email template to use when sending over a note asking someone to download a file. This template also comes in 3 flavors – one for PDFs, one for audio, and one for any other files, as well as 6 colors – so youre able to easily customize your readers download experience. This is a perfect email template to use send when youre welcoming new members to your service. If you write a blog, this is a great template to share your info and updates in a newsletter to build a stronger relationship with your readers. This email template was specially built to communicate promotional offers in a quick and efficient manner. 2-column (right-hand sidebar) email template with an organic feel and navigation links available to use in the header. Mailchip four basic, flexible templates that you can use to get started. They’ve been tested to render properly in all the major email programs, like Outlook 2007, Lotus Notes, Gmail, and more. Here are some other sites which also offer up free newsletter templates for download. This is a beautifully designed theme, although it requires you to register (for free) on the site. 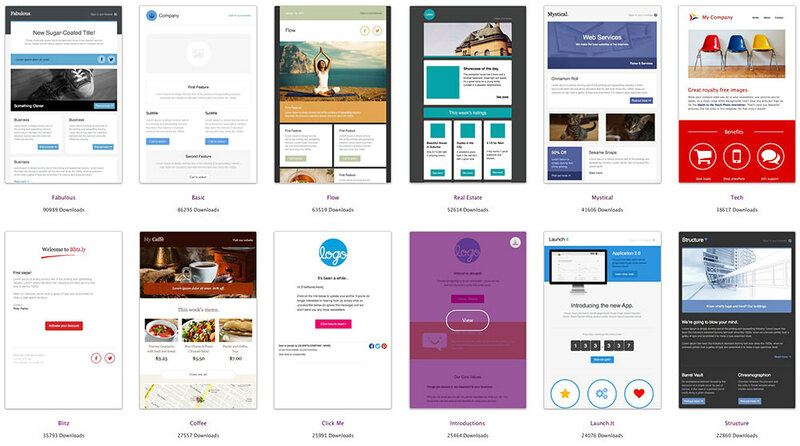 A variety of free templates, but it requires (free) signup. Editor’s note: This post is written by James Yeang for Hongkiat.com. James is the writer of a Malaysian tech blog called Friedbeef’s Tech.